Dubrovnik. To be honest, I couldn’t pronounce it, and I’d never heard of it when I first booked our cruise. Google images showed an unromantic but historic seaside, fortified town. (Game of Thrones fans may recognize it as King’s Landing.) My ignorance and low expectations set me up for the most pleasant surprise of the entire trip – Dubrovnik is delightful! A short ride by shuttle takes you to the medieval city enclosed in towering walls. Inside you’ll find museums, a monastery, shops, restaurants, a small port, a town square and at least one church. One ticket can get you into all the museums, as well as entrance onto the walk on top of the wall. Both the bustling main street and the steep, winding side streets give you a sense of what it may have been like to live during its heyday. We only had a few hours so we stopped by the monastery for a peaceful rest and some photo ops. The walk around the wall offered lots of photo opportunities, as well as a small bar along the way. This is a tourist spot, without question, but that doesn’t mean you don’t get a glimpse at the locals. You waiter is probably a local student. One of the bars later that night were taken over by a a ladies night. Some local musicians performed their interpretation of some American classics at cafe outside on the cobblestones. For me, the real adventures were the excursions that took us outside the average experience. I only insisted on pre-booking one excursion, and it was this one – a drive along the Dalmation coast that stopped at an olive oil orchard (farm? mill?) and a vineyard. Best decision ever! First, you must let go of any negativity coming from the fact that you’re traveling in a tour bus with retirees and that you won’t be “dropping in on locals” as they go about their daily business. Hundreds have come before you and hundreds will come after, but that doesn’t sully their product or the process in which it’s made. A bathroom stop in the village of Ston let us look at a salt “museum” from the outside, which was basically a low-yield salt flat. We bought a huge bag of salt flakes for about $3. Warning: the bus will leave without you… as they reminded my husband and I after we arrived 3 minutes late. Eh. They found a seafood restaurant that would accommodate our large group with a pre-determined meal. It was some sort of seafood pasta with a small dessert. The highlight was table wine included with the meal. I forgive the lackluster lunch because I know the constraints of time, price and party size. But if you’re a foodie and don’t want to waste a single meal… you’ll have to avoid the group excursions. I compromised by ordering 3 raw oysters for a taste of local seafood and paid separately. The second major stop was a winery that also made fruit liquor. Pomegranate, orange, cherry… you want dessert liquor, you’ve got it. Also, after a short presentation in the wine cellar, we tasted the bold reds that the region is known for. Grown on rocky hillsides and battered by the sun, the thick-skinned grapes of Croatia lend themselves to stronger, bolder reds. There’s a snapshot included in this video. Who could turn down a ride on a pirate ship? This late night excursion on a full-fledged wood pirate ship picked up its passengers right outside the ship and took a 45 minute ride to Dubrovnik’s port. 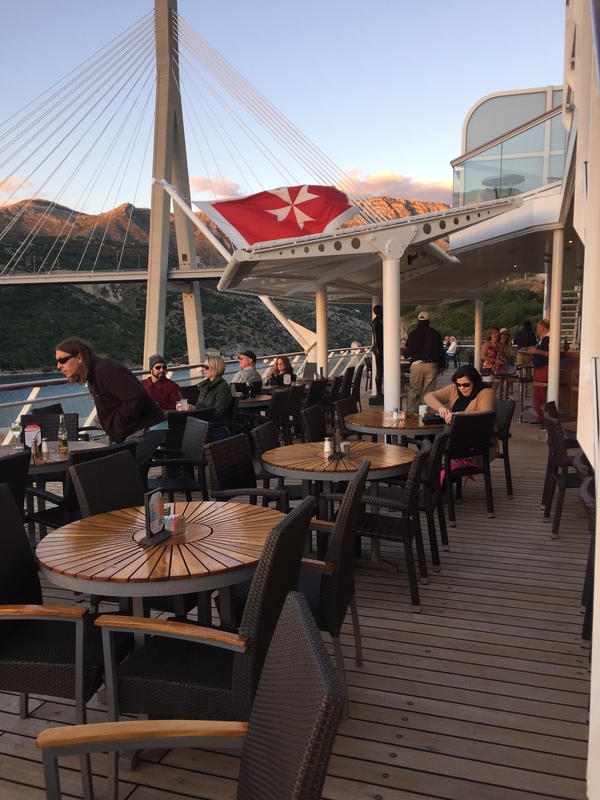 The ship is outfitted with a bar, indoor seating and picnic tables on the deck. I’ll be honest – it was cold, rainy and would have been miserable if not for my stubbornly positive attitude. Pirates experienced harsh weather, so why shouldn’t I? So my hubby and I enjoyed glasses of wine in the rain at the head of the ship as we looked out on the lights dotting the Croatian coast. I’m clearly too stubborn for my own good. Most stayed inside and left for the ship when they docked instead of spending an hour walking around the town and taking the ship back. The stop allowed us to have some seafood pasta underneath a heat lamp at a side street restaurant and sip a drink at an outdoor cafe while listening to a jazz band. As you’ll see from my post about the Amalfi Coast, I recommend you have low expectations – it leads to revelations and surprises, instead of disappointment and a reality check. Don’t discount Croatia just because it hasn’t been painted as a romantic European destination. Nothing in America compares to a seaside medieval town. But for all my praise, I really don’t think you need more than a day or two.